Phelps, a social scientist-turned-caregiver, blends her training with her personal journey: a “must-read” for anyone caring for a loved one. The benefits of asking for help and indulging oneself not only affect the caregiver, but ultimately affect the quality of care given to the patient. These indicators speak to the urgent need to support caregivers who frequently have no background or experience to prepare them for their role. Phelps not only shares her journey as a wife, but draws on her sociology background to guide the reader through a complex healthcare system. The result is a nuanced chronicle that takes the reader through the courtship of a loving couple to the end of their life together. Along the way, Phelps leads the reader through a labyrinth of challenges: securing a diagnosis, accessing high quality medical care, advocating for the patient, providing care at home, and ultimately, determining how and when to accept death. 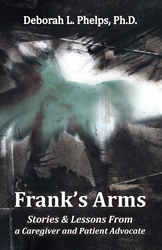 In addition to its blend of the personal and theoretical, Frank’s Arms shines a light on the “other side” of caregiving – the toll it takes on the caregiver, and if the patient dies, the void the caregiver experiences. Feinberg and Levine stress the importance of addressing caregivers’ needs to avoid the risk of burnout from prolonged distress and the physical demands of caregiving. Phelps shares a story of devastating fatigue caring for her husband, her self-advocacy, and her evolution to self-discovery. Through her eyes, the reader learns myriad strategies for self-care. Phelps encourages readers to consider these strategies, but more importantly, to find whatever works to provide them emotional and physical relief. “There’s no single answer as to what a caregiver needs, but the common denominator is this: caregivers must reach for support at a time when the natural impulse is to place all energy on caring for the loved one. The benefits of asking for help and indulging oneself not only affect the caregiver, but ultimately affect the quality of care given to the patient,” Phelps said. Deborah Phelps holds an undergraduate degree in sociology from Washington University in St. Louis. With a National Institutes of Health (NIH) pre-doctoral fellowship, she earned a Master of Arts in sociology and a Master of Philosophy with specialties in medical sociology/social psychiatry and social psychology and a doctoral degree in medical sociology/social psychiatry from Yale University. As an NIH post-doctoral fellow, Phelps earned a master’s degree in Psychiatric Epidemiology and Biostatistics from Washington University’s School of Medicine. In addition, she is certified as a sociological practitioner by the Association for Applied and Clinical Sociology, which qualifies her to practice sociotherapy. Phelps is a professor of sociology at Fontbonne University and is on the editorial board of the Journal of Applied Social Science. AARP is a nonprofit, nonpartisan organization, with a membership of nearly 38 million, that helps people turn their goals and dreams into real possibilities, strengthens communities, and fights for the issues that matter most to families, such as health care, employment and income security, retirement planning, affordable utilities, and protection from financial abuse. Established in 1996, the National Alliance for Caregiving is a nonprofit coalition of national organizations focusing on advancing family caregiving through research, innovation, and advocacy. Carol Levine is director of the United Hospital Fund’s Families and Health Care Project in New York City. She also currently serves on ASA’s Aging Today Editorial Advisory Committee. Lynn Friss Feinberg, M.S.W., is senior strategic policy advisor with the AARP Public Policy Institute in Washington, D.C. She also currently serves as Board Chair of the American Society on Aging (ASA).